Minutes ago -- and without Jim Fowler to do all the dirty work for me -- I just lovingly removed a red-bellied woodpecker from our basement family room. 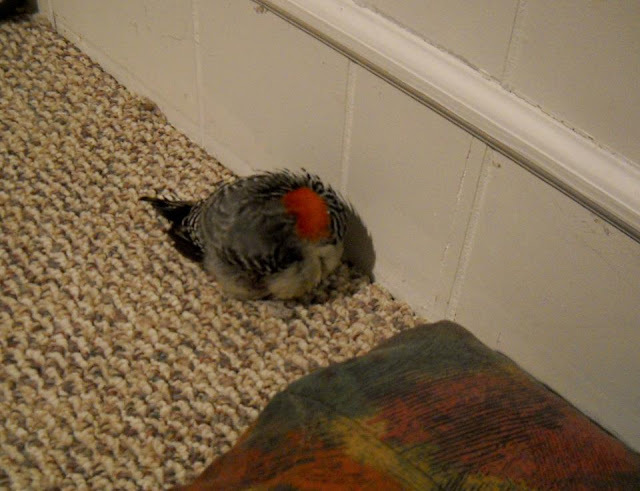 It was roosting on the carpet in a corner of the room, settled in for the night. It had to have flown down the flue, as opposed to flew down the flown, and then pushed the iron door at the bottom open. Lucky for it it did; I've found a mummified bird in there before, and a live one or two over the years as well. This, however, was the first woodpecker who decided to squat in the basement. When I let it out the back door, it perched on my hand for a while like it was thinking about whether it really wanted to leave. Then it flew off. Good choice. We have Molly the Dog and her house guest, Boo, who might have seen the woodpecker more as lunch than as fodder for a blog post.